Wouldn’t you love to wake up to this view each morning? 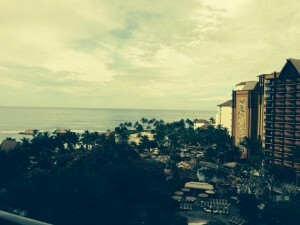 It is the view from a room at Aulani a Disney Resort and Spa in Hawaii. How about waking up here knowing you booked it with a Disney discount? Disney has released another new discount for Aulani. They have deals now that stretch all the way into June 2014. The latest offer will give you a resort credit. You have to book a minimum of a 4-night stay. Your family vacation dates should fall between April 23 and June 16, 2014. The resort credit will vary by the type of accommodations you book. Aulani offers villa style accommodations. They also offer hotel style rooms. If you book a minimum 4 night stay in a one bedroom or a two bedroom villa your resort credit will be $500. If you a minimum 4 night stay in a deluxe studio or a hotel room your resort credit will be $400. You will not be able to use this offer for three bedroom villas or suites. Disney is allowing two rooms per reservation booked. You can use the credit throughout the Aulani Resort for Disney experiences such as dining, shopping, and the Laniwai Spa. The amazing Disney difference offered at Aulani will be a vacation experience your family will remember forever. What can you expect a Aulani? Hawaii Disney Style at Aulani! Aulani a Disney Resort and Spa is located in Ko Olina,Hawaii. It is nestled between mountains and beaches on the western shore of the island of O’ahu. This is a Disney vacation experience. You can expect lots of Disney differences. You will find yourself immersed in Hawaiian culture and Disney magic without even leaving the resort. 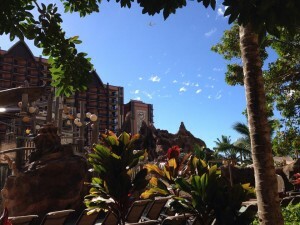 Disney takes their expertise in story telling and shares Hawaii with you their way at Aulani. You will get to know Uncle at Mo’olelo Storytelling. He is Aulani’s Hawaiian Elder. Guests of all ages will enjoy hearing him tell his amazing Hawaiian stories around the fire pit. Expect the stories to be magical. Uncle also hosts the Starlit Hui. You will experience a blend of traditional Hawaiian entertainment with some modern touches at this event. There will be hula dancing and Disney characters. How can that not be fun? The Disney characters will be a big part of your Aulani Disney vacation. You can learn to surf with Disney characters. They will also teach you the latest in surf lingo, too. Do you like to dine with the Disney characters? Disney offers character dining at Aunty’s Breakfast Celebration at the Makahiki. Your dining options at Aulani have lots of Disney touches. They even have resort refillable mugs you can purchase. There are four quick service style restaurants and each pool has a counter service dining option. There are two full service restaurants at Aulani. Enjoy the ambiance of outdoor dining at Makahiki – The Bounty of the Islands. If you love a Disney signature dining experience you will love ‘AMA‘AMA – Contemporary Island Cooking. That is only a small taste of what you can expect. Hawaii Disney style is waiting for you! Previous PostTouring ~ FastPass+ in Magic KingdomNext PostEpcot Flower & Garden Music, Food, Fun!